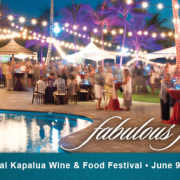 Our sister restaurant, Gannon’s, will be participating in the 2016 Kapalua Wine & Food Festival’s Seafood Festival on Sunday, June 12th. This is part of the 35th annual festival which runs from June 9-12 at the world-renown Kapalua Resort. 14 of Maui’s Top Restaurants showcase a seafood specialty and culinary creation in competition for Maui No Ka Oi Magazine’s “Best of the Fest” award. Hawaiian entertainment provided by Nuff Sedd.